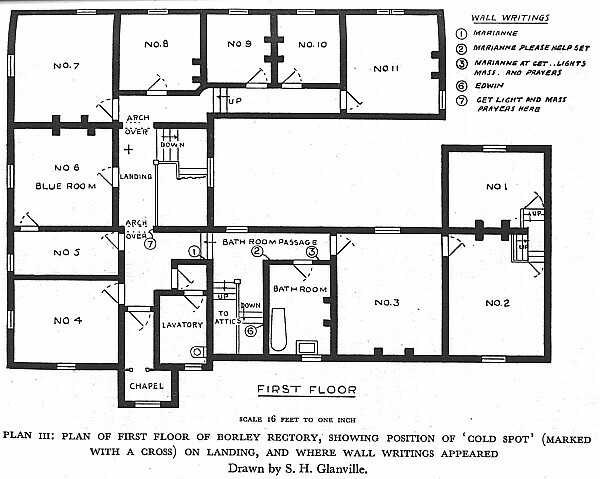 First Floor Plan of Borley Rectory drawn by Sidney H. Glanville, one of Harry Price's official observers who spent a great deal of time at the Rectory during the tenancy of 1937-38. This appears to be the second version of the floor plan that Glanville prepared & is the one which was used by Harry Price in both The Most Haunted House in England (Longmans, Green & Co., 1940) and The End of Borley Rectory (Harrap, 1946). There are omissions & inconsistencies between both sets of Glanville's drawings - compare the first version that includes the corridor window to the 1877 extension which is omitted from this later drawing and the re-drawing of the lavatory area adjacent to the chapel.